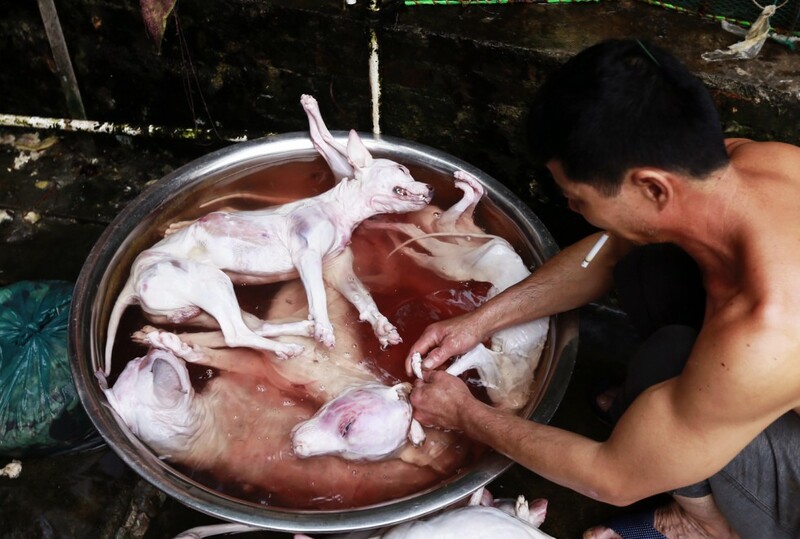 A trader cleans skinned dogs and cats. The dog on top was apparently a pet slaughtered for food, based on its breed. A cat climbs up the cage at the slaughterhouse, trying to escape. This cat was later rescued by Peter Li. 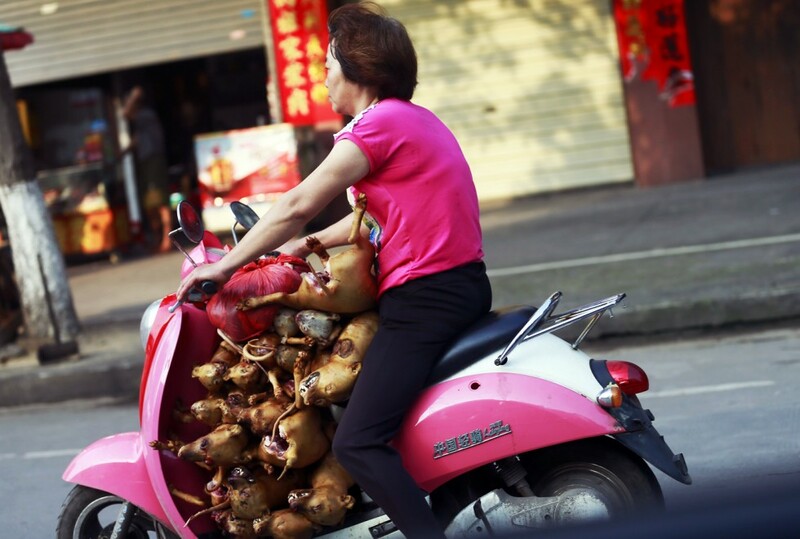 At 7am on May 26, a woman on a moped transports more than 10 dogs, which had just been slaughtered, to her market stall. 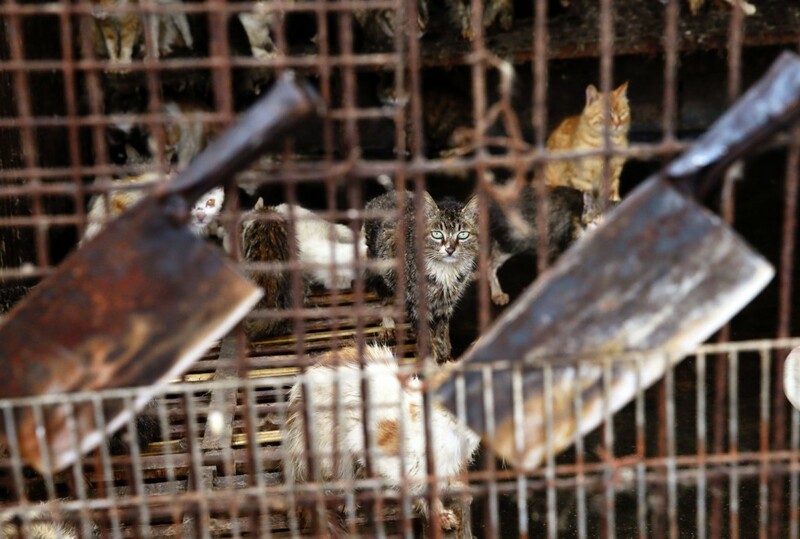 Two kitchen knives are shown stuck in an iron cage, which are used to butcher dozens of dogs and cats every day. 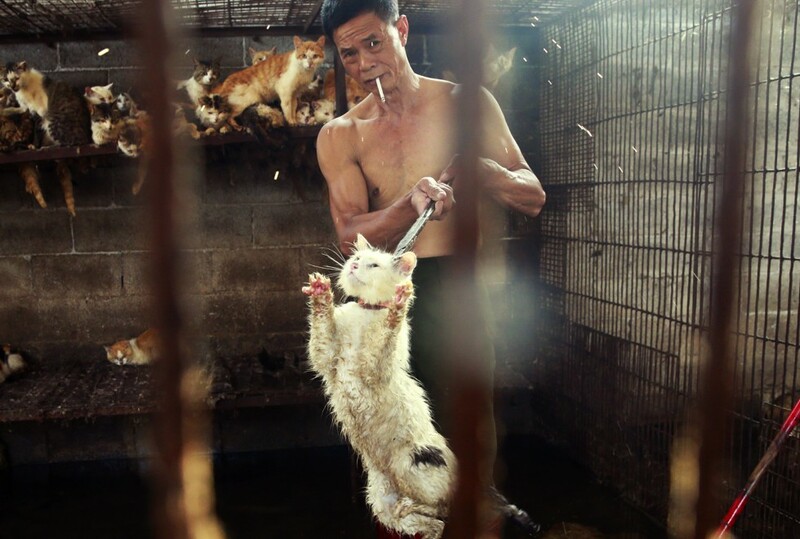 These knives have to be sharpened daily due to the sheer number of animals they’re used to slaughter. 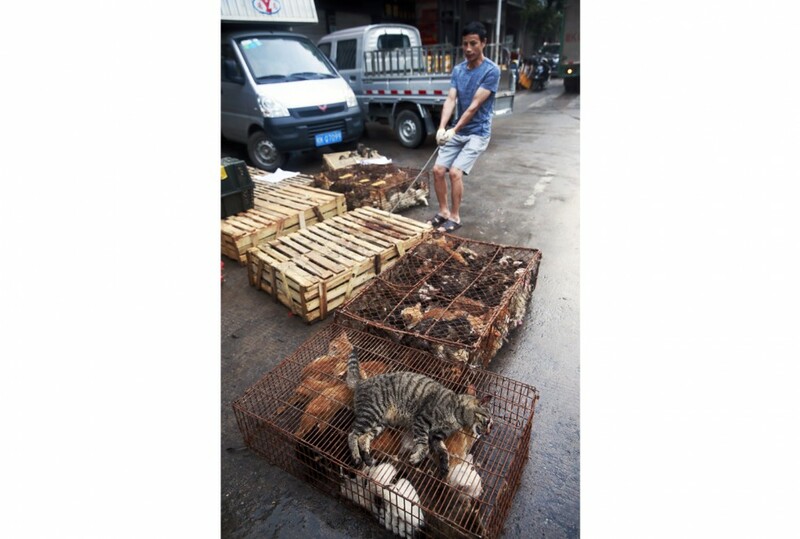 At 6am on May 26, a group of cats from Sichuan Province arrive at Renmin Middle Road on a truck, before they are to be transported on carts to a slaughterhouse. 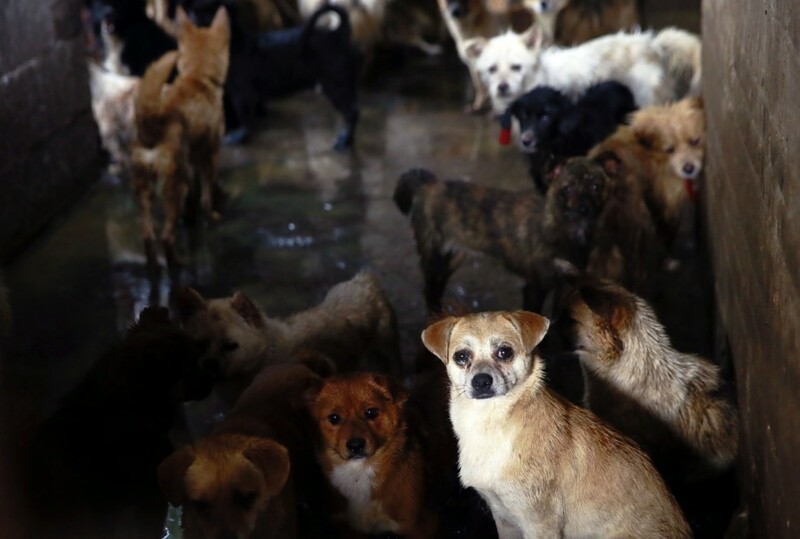 Hundreds of dogs await their death as they watch fellow dogs slaughtered before their eyes. 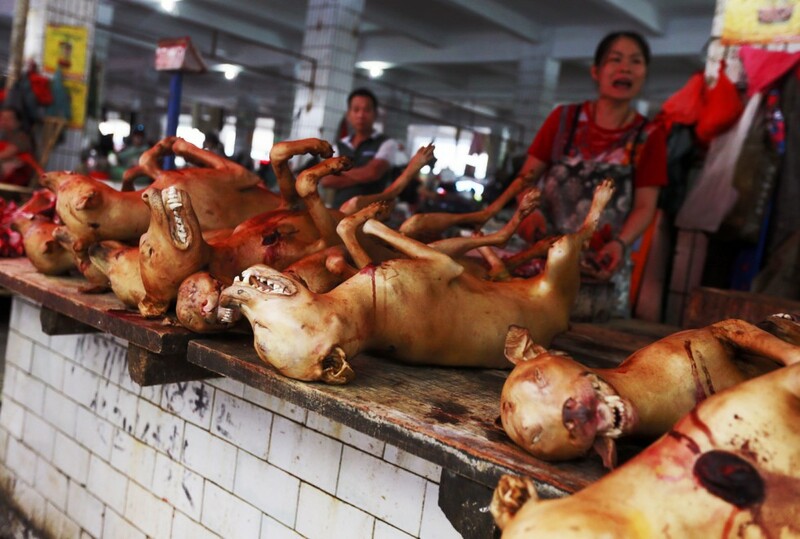 Dog meat displayed in a marketplace. 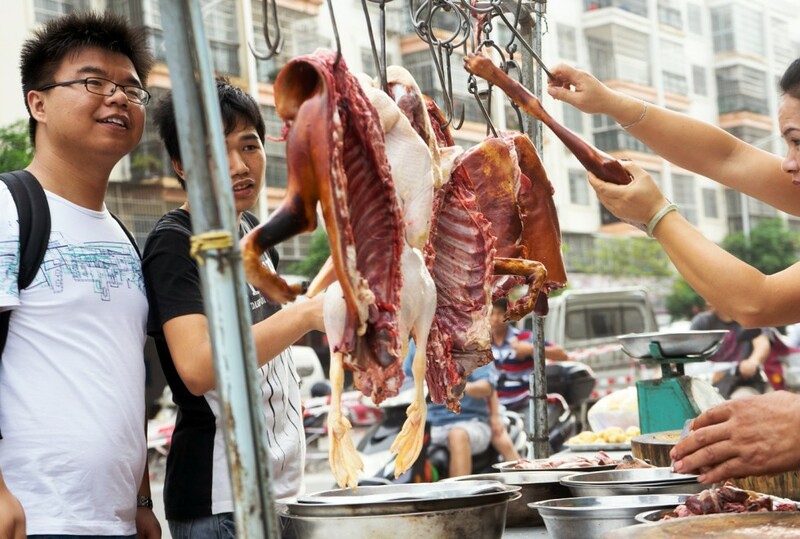 Late in the afternoon on May 25, residents shop for dog meat from a stall on Riverside Road. 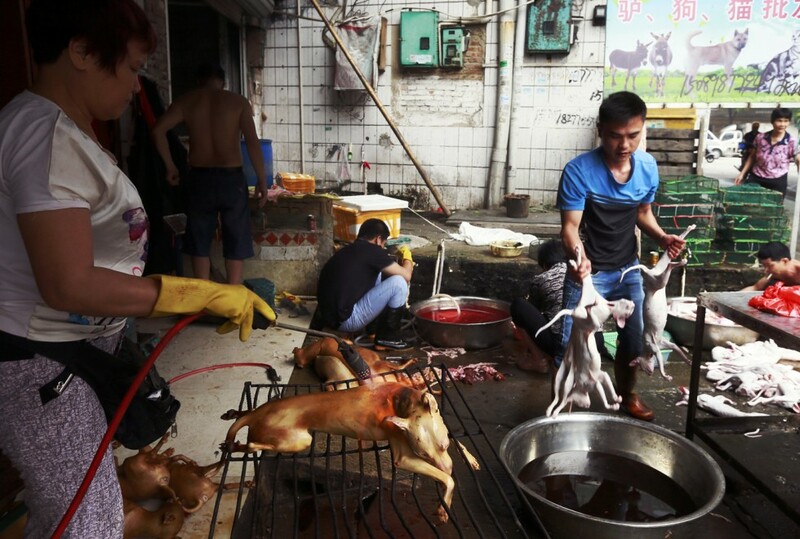 Workers prepare dog and cat meat for sale. 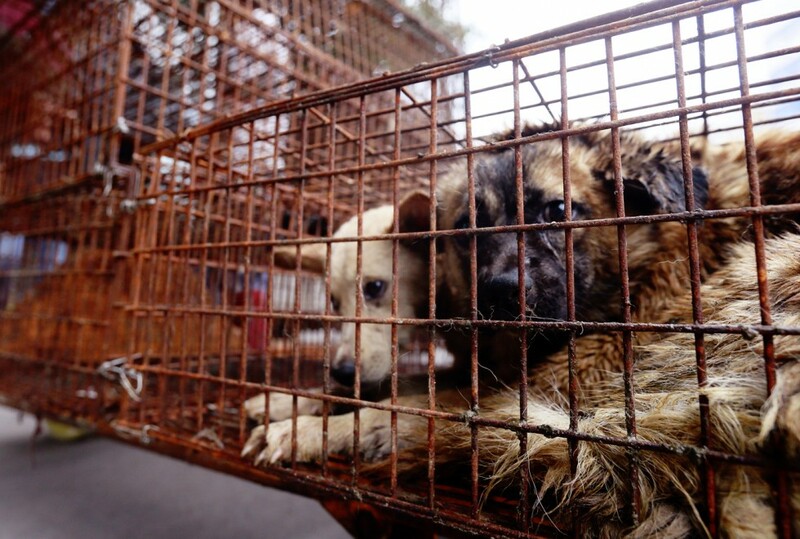 A truck arrives in Yulin on May 25 with nearly 1,000 dogs of various breeds crammed into narrow wire cages with no space to extend their limbs. 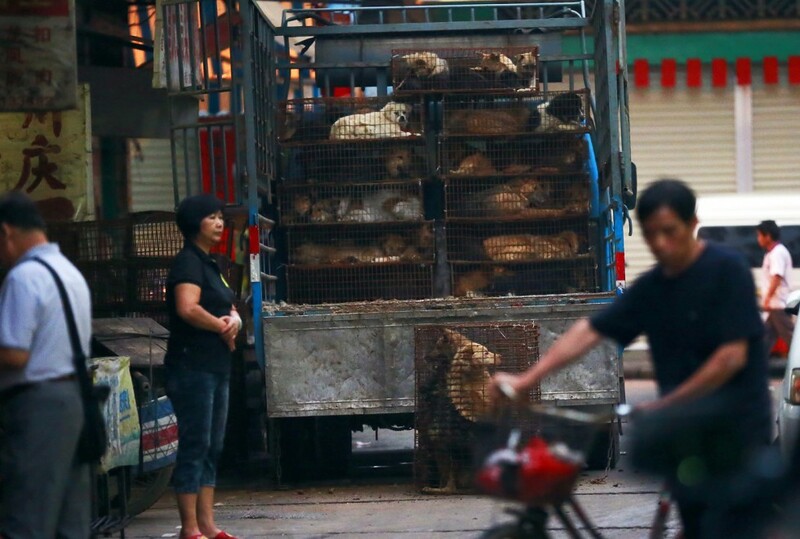 According to the driver, the truck came from Sichuan province, 1,290 kilometres west of Yulin. The traumatised dogs waited in silence for the next stop on their journey. Dogs are hung up for sale for meat in Dong Kou market, as a dog looks on. Please be aware that the following gallery contains some disturbing imagery and viewer discretion is advised. 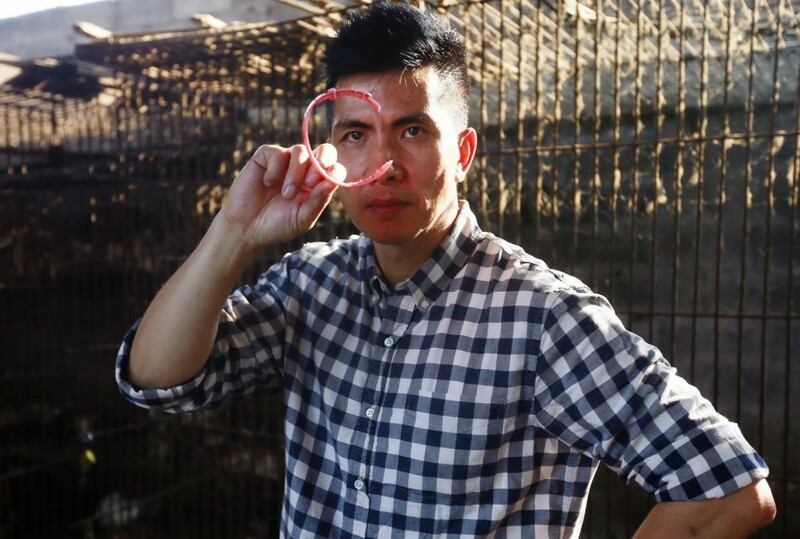 Humane Society Internationalís (HSI) China specialist Peter Li visited dog meat markets and slaughterhouses in Yulin city in the Guangxi region, where locals consume dog and cat meat to observe the summer solstice each year on June 21. HSI has been working with local groups in the country to end the animals’ suffering. 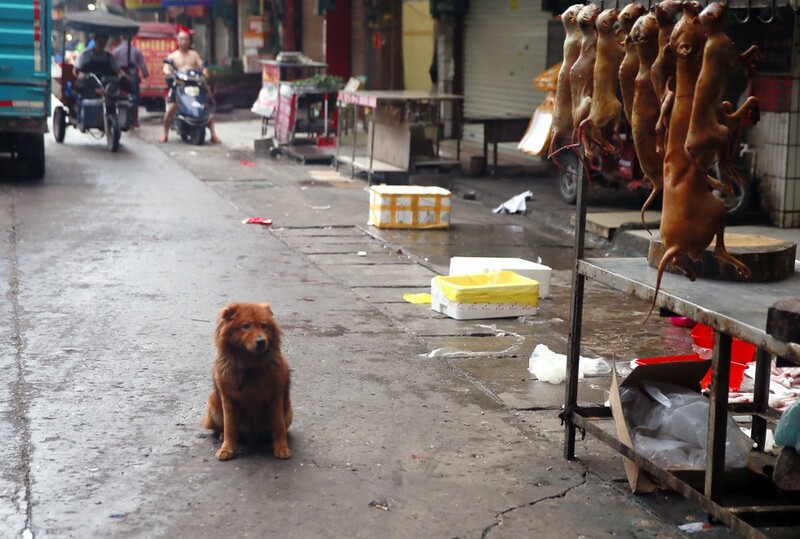 Though the dog meat trade is in decline, some slaughterhouses remain in operation. Cats and dogs are seen as food rather than pets in some Asian countries and efforts by Western-based pressure groups to end the practice of eating the animals have raised questions over whether it is any worse to eat a cat than it is to consume a pig or a cow. 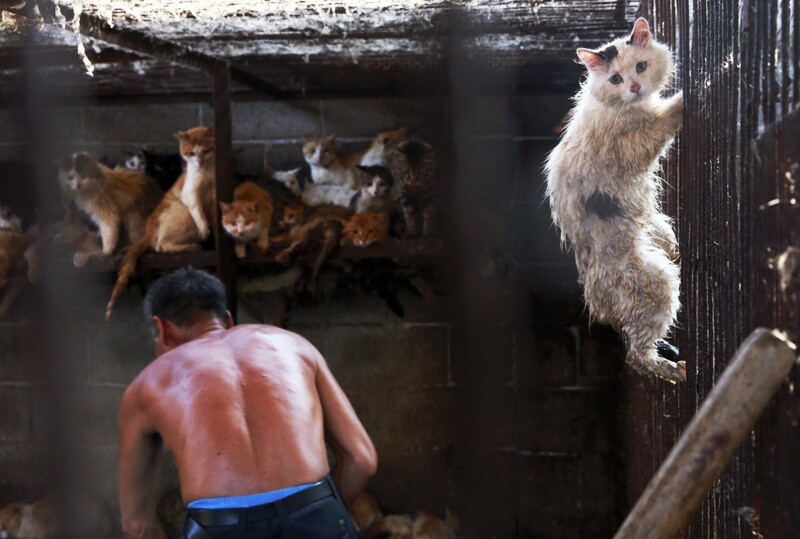 However, pressure groups say cats and dogs are different to livestock because they are intelligent companions to people, and that the method of killing them – coshing them and then putting them in vats of boiling water to loosen their fur – is unnecessarily cruel. Cats are eaten in parts of southern China, where the meat is considered a warming winter food, mostly by older people. A China Daily report from 2012 estimated that 4 million cats a year are eaten nationwide and said the animal was one of the main ingredients, along with snake and chicken meat, in a traditional dish called “dragon, tiger, chicken”, which is said to fortify the body. It used to be eaten in Japan but that is now considered unacceptable, and it is taken as a tonic in parts of Korea, where it is believed to ease neuralgia and arthritis. While most Europeans are horrified at the notion of eating cat, the creatures are still devoured in parts of rural Switzerland, where consumption is viewed as a matter of personal ethical choice, and there are recorded cases of feral cats being eaten by Australian Aborigines. Historically, people in the West were less squeamish. In the Middle Ages, in England, a popular housewarming meal is said to have been a cat roasted slowly on a spit. Cats were also used in traditional medicines of the era. In Charles Dickens’ Pickwick Papers (1836), there is an account of pies made from kittens being sold as “meat pies” in London and a British newspaper in 1885 reported a case of a woman convicted of passing off cat meat as rabbit meat. Cat meat was also reportedly passed off as rabbit and eaten during world war rationing in Europe and jokingly nicknamed “roof rabbit” by customers who suspected that what they had been sold wasn’t quite as advertised. ← The first Earthquake in Malaysia to have claimed lives. 16 people killed, 2 missing in Mount Kinabalu. This is a barbaric & cruel tradition. Laws must be passed & enforced. Many animals as well as pets are hero’s in the USA. Saving many llife’s also helping the disabbled& in therpyfor all types of people. Would you eat or abuse a hero or such a variable person in your county? It’s such a safe, sickeningly cruel practice.